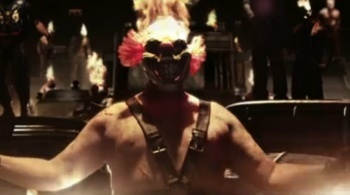 The new Twisted Metal lives up to its heritage - and its name. Yes, David Jaffe was lying to us all those times he said he wasn't working on a new Twisted Metal game, but you'll probably forgive his fib as soon as you lay eyes on the game, which embraces the first half of its name with unabashed joy. The object for the online play for this newest entry in the franchise, which is a bit more lighthearted than Black ("We have serial killers, but they're the 8-o'clock-on-CBS kind of serial killers," says Jaffe), was to fine-tune the class-based play and emphasize the need for team tactics. "We've always thought of [Twisted Metal] as a fighting game in cars," explained Jaffe before introducing us to Nuke Mode, which is similar to Capture the Flag. The team is working really hard to make sure the balance between the vehicles is fair, so that skill is the deciding factor in who wins a match, not what cars they've got. "We look at Street Fighter IV as inspiration for our online." While Twisted Metal's single player features the story-based progression of specific characters, the online play is all faction-versus-faction. Each Nuke Mode level features two huge statues of faction leaders, and the goal of your team is to take down your opponents' statue before they blow up yours. These things are huge, though, towering high into the air, so you'll have to fire off a cruise missile to bring them down. To arm your missile launcher, you have to capture the faction leader - we saw Sweet Tooth and Dollface - then keep them in the vicinity of your launcher long enough for it to arm and launch the rocket. This is Twisted Metal, though, so it's not as though you're chatting amiably with your opponent while you wait for the warhead to warm up. The faction leader mans a giant gun turret, and won't come along quietly. Once you capture them, you drag them behind your car, then sacrifice them to the launcher. It's all wonderfully, wonderfully wrong. You'll definitely need support from your team, though, because you can't fire your weapons while you're within the circle that charges the launcher. Your rocket is also vulnerable to enemy fire once it's in the air, so you'll need to coordinate protection to have any hope of it reaching its destination. Protection from, say, Vermin, whose Rat Rocket can take out the enemy cruise missile pretty handily. The exterminator truck was just one of the vehicles we saw; there was the Meat Wagon, an ambulance that launches patients on gurneys as missiles (which you can then guide through the streets for extra damage); Reaper, a motorcycle that's weakly armored but whose driver can pop a wheelie to drag a chainsaw along the ground in order to heat it up and make it a flaming chainsaw (for triple the damage); and the Talon, a helicopter that can provide aerial support by shooting down cruise missiles or picking up cars and flying them past obstacles. The final version of the game will have 12-16 vehicles, some of which will be returning from previous Twisted titles. Every faction can drive every vehicle, so choosing your faction is simply a matter of personal preference, it's the cars themselves that differ. Vehicle stats differ in many ways: armor, turbo charge rate, launcher charge rate, carrying capacity, and of course, special weapons. Each vehicle has its own unique attack, and each special also has an alt fire. The level we saw - which doesn't have a name yet, but was a burnt out city - had many different approaches to the faction leaders, destructible environments, and hidden shortcuts, leaving plenty of room for multiple plans of attack. There will be progression in the online play, but "it ain't Call of Duty," according to Jaffe. It's still very much a work in progress, and Jaffe was tight-lipped about the single player mode and the characters we can expect to see, but Twisted Metal's online certainly looks to have potential. We should hear about more online modes in the near future.